A Network Operations Center, or NOC, is the primary work space engineers utilize to monitor, manage and troubleshoot problems on a network. The Network Operations Center offers oversight of problems, configuration and change management, network security, performance and policy monitoring, reporting, quality assurance, scheduling, and documentation by utilizing sophisticated network management, monitoring and analysis tools. The NOC provides a structured environment that effectively coordinates operational activities with all participants and vendors related to the function of the network. The NOC technicians typically provide support twenty-four hours a day, seven days a week. Monitoring operations of all backbone links and network devices. Ensuring continuous operation of servers and services. Providing quality support for network users. Troubleshooting of all network and system related problems. Opening tickets to track and document resolution of problems. 24 hours a day, 7 days a week supervised operation by highly skilled network and system engineers. 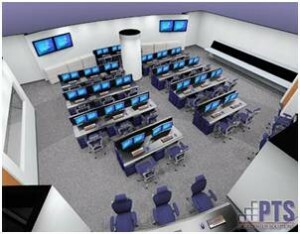 PTS has experience in designing, building, and installing Command Centers, Control Centers, Network Operation Centers, Network Management Centers, Network Control Centers, Data Centers, Security Operations Centers, Mock Trading Rooms and various other monitoring intensive control facilities. We can provide a turn-key solution by handling everything you need including space design, console furniture, audio/visual systems, network & support infrastructure monitoring and/or managed services as well as installation including display and video walls. PTS can help you make the most out of your available space. We start by analyzing your specific needs and goals for the project including the operational requirement, space limitations, time constraints and budget objectives. With your goals in mind, our team of designers and audio/visual experts develop possible configurations. Working closely with you, we make the necessary revisions to initial design concepts to arrive at the best possible solution for your particular operation. 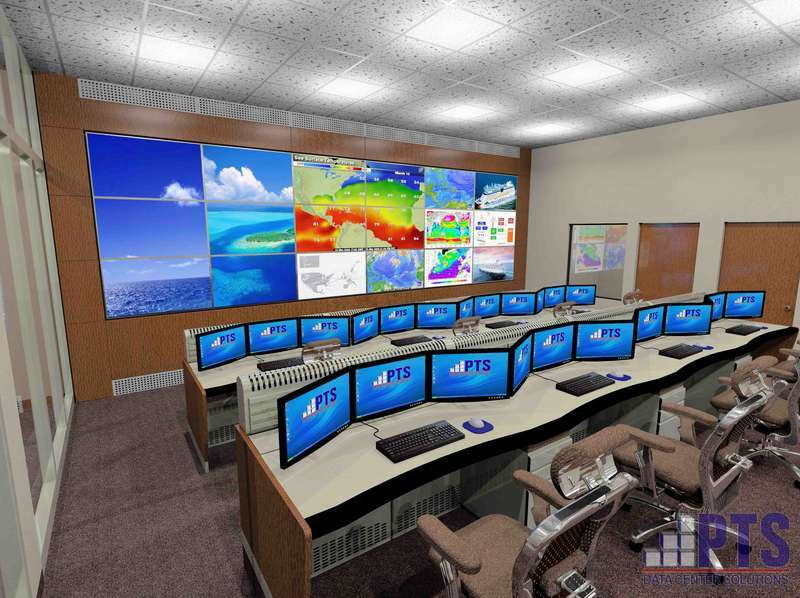 PTS Data Center Solutions has a proven process & holistic approach to plan, design, and build your Command & Control Center to meet all your design criteria. Our aim is to provide a Network Operations Center design and solution that is conducive to having people, technology, and facilities work seamlessly together. These services leverage the fifth phase in the eleven (11) step progression of the PTS data center project process. In addition to providing experienced, high level Network Operations Center design services, PTS is the single-source vendor you can rely on from the Conceptual Planning & Feasibility Phase, through the Design & Engineering Phase, to the Construction, Implementation & Commissioning Phase, and finally to the Support & Maintenance Phase.